Civil engineers design and supervise large-scale public work construction projects, such as roads, buildings, tunnels, dams, and bridges. They are responsible for gathering project requirements, testing and evaluating building sites and materials, and managing the overall building process from start to finish. That means that civil engineers need to see and understand the big picture, and also be able to execute the tiniest of details. Civil engineers typically require at least a bachelor’s degree. Graduate degrees and licensure often are needed for promotion to senior positions. The skill requirements for any civil engineer job vary widely based on the position. However, every civil engineer should have a strong understanding of industry and government standards, requirements, and guidelines. In addition, civil engineers should have strong analytical thinking, technical writing, and communications skills. Below is a sample resume for a civil engineer. You may read the sample below or download the template by clicking on the link. Seasoned, detail-oriented Civil Engineer presenting 9 years’ experience leading design and full life-cycle construction of multibillion-dollar public works including roads, tunnels, bridges, and buildings. * Leverage deep critical thinking and innovative design skills to develop historic, environmentally sensitive public works projects erected upon sound construction principles and within established budgets and timeframes. * Proven leadership and project management talents exercised throughout site selection, analysis, planning, design, and construction phases. * Diligent in submitting all permit applications and other documentation to local, state, and federal agencies. * Superb knowledge of all governing civil engineering standards, requirements, and guidelines. * Technical proficiencies include Microsoft Office Suite, Civil 3D, Microstation, and AutoCad. Ensure timely execution of project deliverables for established engineering consulting firm. Scope of responsibility includes roadway and building design, project planning and management, and permit procurement. Contributed to $4.5B interstate expansion and tunnel projects. Recognized by senior management and project stakeholders for excellence in reinforced concrete and steel design, sensitivity to environmental impact and risks, and skillful budget management talents. Utilized Computer-Aided Design (CAD) to create blueprints, designs, layouts, and calculations. Analyzed survey reports, maps, and data to plan projects, established viable project scopes and timelines, and conveyed design ideas clearly to senior decision makers, subcontractors, and construction teams. Created detailed project deliverables for industrial, commercial, and institutional clients that were consistently constructed without major roadblocks due to careful planning, design, and preparation. Displayed excellent comprehension of zoning entitlements and the permit procurement process. When crafting your resume and cover letters, it's a good idea to include keywords that highlight your skills. While you can include them within a skills section on your resume, it's also helpful to weave them into the bullet point descriptions of previous roles you've held. Be sure to include specific examples of times when you demonstrated those skills at work. Remembering keywords describing these skills also is a good idea during job interviews. Of course, every job requires different skills and experiences. Make sure you read the job description carefully and focus on the skills listed by the employer. Consider the five skills below among the most common and important for engineers, but also familiarize yourself with some additional keywords describing skills that might be just as important, depending on the specific job. Communication skills are extremely important for civil engineers, who often lead teams of diverse people and have to communicate effectively with all of them. They also have to speak to clients and the public, explaining complex technical ideas in clear ways. Another element of communication skills is listening. Civil engineers need to listen carefully to the concerns of their co-workers and the needs of their clients. Civil engineers work on almost every step of a project, from planning to design to construction. Civil engineers are typically very skilled at problem-solving. Throughout each project, they have to solve complex technical problems and come up with creative solutions. These solutions have to be safe, efficient, and cost-effective. Therefore, civil engineers need to have strong critical thinking skills. They have to weigh the pros and cons of different solutions and make the best decisions. Civil engineers often manage diverse teams that consist of contractors, architects, construction managers, other engineers, and more. They have to effectively lead and manage each team, making sure projects are completed successfully. That means building relationships with all members on the team, and providing effective motivation. Communication skills are also a big part of being an effective leader—with strong verbal and written skills, managers can set expectations and timelines, and provide direction and feedback. Learn more about leadership skills. As leaders on a project, civil engineers have to be able to see a project through from start to finish. They must manage many different types of professionals and work effectively with clients. They have to make difficult choices to make sure that each project is completed within budget, finished on time, and done well. Project management software helps, of course, but civil engineers must be skilled at estimating how long different aspects of a project will take. They must spot (and account for) dependencies, and also build in time for when unexpected setbacks occur. While soft skills like leadership and communication are critical to civil engineering, civil engineers also require hard skills, particularly technical skills. 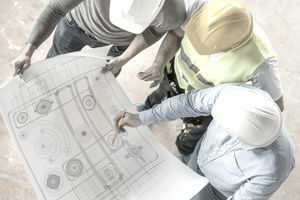 They must be skilled in math and physics, as well as map reading, reviewing blueprints, design techniques, and computer-aided design (CAD) software. These technical skills are essential to ensuring that the projects civil engineers work on are structurally sound. While the skills above are perhaps most common and most relevant, they do not provide an exhaustive list. Other keywords civil engineers should consider using in resumes and cover letters include analytical thinking, decision making, detail-oriented, mathematics, organizational skills, physics, and proactive.